Although we’d all like to have a plethora of NICs in our physical home lab servers, it’s usually a bit more budget friendly to go with anywhere from two to four NICs. This can be a challenge to create a robust set of virtual networks that can be used to study and test a variety of networking scenarios. This post will cover a few tricks that can be used to help create an efficient virtual network for your home lab servers that will also maximize your testing and learning opportunities. Note: These designs are not necessarily best practice in a production environment, and are meant to help introduce a beginner to a wide variety of scenarios for a lab situation. For any vSwitch configuration that you create, a home lab will need these port groups (at a minimum). If you’re limited to a pair of NICs, there is still a rather decent way to set things up to tinker with vSphere in your home lab. Here is a high level layout. We don’t normally want to mix Storage Traffic with Normal Traffic, but in this case there is no choice. vMotion is Active / Active so you can experiment with dual vMotion vmkernels, which is a new feature with ESXi 5. You might need to make a second portgroup to ensure that both vmkernel ports choose a different uplink, but I have yet to find that to be the case in my lab (the configuration as shown works). iSCSI 1 and 2 are configured to allow you to experiment with iSCSI binding. Yes, you can do iSCSI binding with this layout and still have all the other traffic scenarios simultaneously! You aren’t expected to have two physical Switches (A and B) as shown. If you are limited to one physical switch, plug both cards into it. The four NIC configuration allows for a more proper setup, as many newer environments today are only given 4 10GbE NICs (especially in the converged infrastructure world). Also, VMware recommends that a server have no less than four NICs and flags any configuration with less during a Health Analyzer check. Here’s a screenshot from my lab showcasing how the switch would look for both normal traffic (which I called Production) and storage traffic. I have an added portgroup called “Storage Trunk” for trunking VLANs into virtual storage appliances that need multiple virtual interfaces. This scenario properly isolates storage traffic. iSCSI 1 and 2 are configured to allow you to experiment with iSCSI binding. 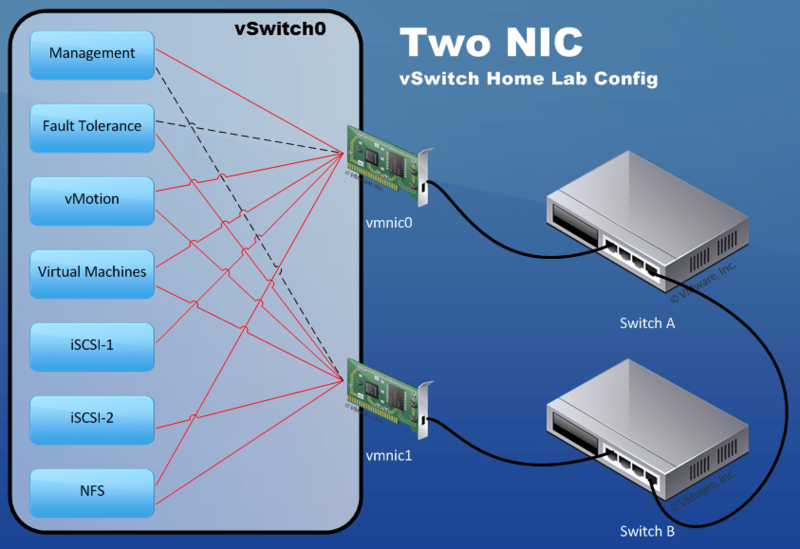 These two configurations should get you started down the path of a well designed and highly available virtual networking design in your home lab environment. 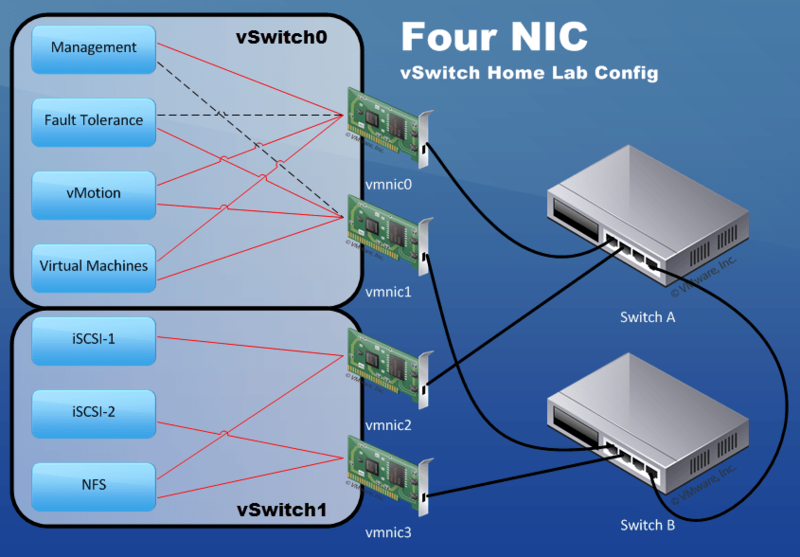 Just because it’s a home lab doesn’t mean you should just create a single vSwitch and leave everything default – go through the practice of setting everything up properly to reinforce good habits later. Disclaimer: I work at Intel in the Network Division. 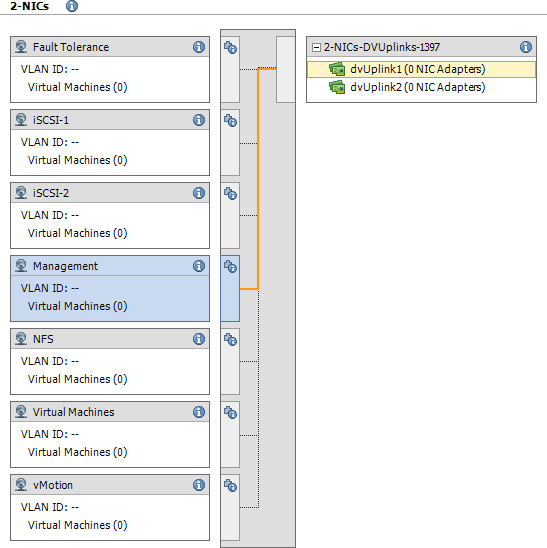 Have you tried setting up vMotion using the same method as with iSCSI? Using multiple port groups with only one active uplink and the other uplinks unused in each. 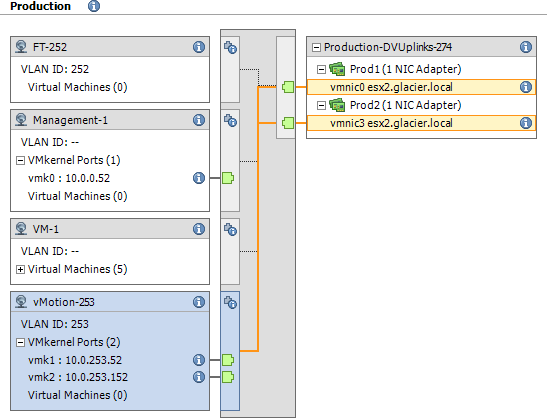 Assigning a vmk with vMotion in each port group uses multi-NIC vMotion feature using both ports. We have setup four 10GbE ports using this method and have seen up to 34Gb of vMotion traffic when moving 8 VMs concurrently. Also, in a two host environment, we have also been connecting a 10Gb port on one host directly to the other host without using a switch. This allows for vSphere to use the benefits of 10Gb even if all the other links are only connected to a 1Gb switch. This model does not work with more than two servers or with more than one vMotion port per host but we have seen some big benefits. Several of our customers are testing this and are looking to move it to their production environments. Good point, I should restate my question and comment. Have you compared vMotion performance between assigning a vmk with vMotion in the same port group with ACTIVE/ACTIVE vs. two port groups using ACTIVE/STANDBY? What I have seen is that using multiple port groups with only one ACTIVE uplink and the other uplinks as STANDBY has better performance than using a single port group with ACTIVE/ACTIVE with multiple vmks. For a multi-NIC vMotion environment I typically use two port groups in an Active / Standby configuration to force using two uplinks. Back when this was written, I kept noticing that the vmk ports would always pick alternate uplinks so I didn’t bother. Just curious, Why do you have switch A and Switch B in both the scenarios above? Does it really matter is you are using a single switch or multiple? They are there for high availability and redundancy. As stated in the article, they are not required for a home lab but best simulate a real world environment. Hi Chris, hope you doing well. I have a question about iSCSI binding for the Two NICs – One vSwitch Configuration. please correct me if i’m wrong, its possible to do binding, but it’s mandatory that the storage must reside on the same ip subnet. So, the vmnic 0 and 1 must reside on the same ip subnet. 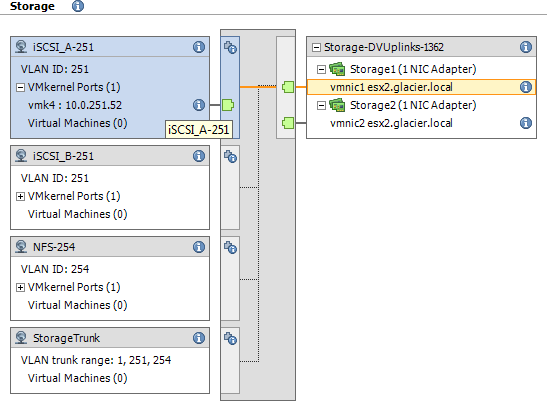 I’m really thinking about buy 2more nic’s so I can separate vm traffic from datastore traffic. Hi again! I have now read the book. Very useful. I have a question regarding NFS designs in the book: Your discussing multiple networks design on page 278 and following. Your saying that storage array ned to use multiple Ip adresses, create two separate NFS vmk ports and then separate by vmnic active/passive and opposite on the other vmk port. You also say that this design is a bit overkill on 10 GB networks. I agree on that. But on page 299, additional vSwitch design scenarios, on the two 10 GB network adapter example you are still using it with vmk NFS1/NFS2 active/passive and opposite. One port group will have a vmkernel interface in the first NFS VLAN, while the second port group will have an additional vmkernel interface in the second NFS VLAN. The active/passive flip ensures that both NFS VLANs do not use the same vmnic unless there is a hardware failure. Yup. That should be fine for the vast majority of scenarios. Simple is often best! I see, thank you again!